As FDA 510(k) consultants, we provides a complete package of 510(k) consulting services to global medical device industry. Our 510(k) consulting services include general medical devices including in vitro diagnostic medical devices (IVDs) and 510(k)s for biologics. Our 510(k) service packages include, but are not limited to, from concept phase to bringing your medical device products to the US market including post-market requirements, to the extent, applicable to your device types. We employ a CAC-SI* strategic method for our 510(k) services on a case by case basis as applicable regulatory requirements widely vary depending upon device types. In the US, most medical devices can be classified by finding the matching description of the device in Title 21 of the Code of Federal Regulations (CFR), Parts 862-892. FDA has classified and described over 1,700 distinct types of devices and organized them in the CFR into 16 medical specialty “panels” such as Cardiovascular devices or Ear, Nose, and Throat devices. These panels are found in Parts 862 through 892 in the CFR. For each of the devices classified by the FDA the CFR gives a general description including the intended use, the class to which the device belongs (i.e., Class I, II, or III), and information about marketing requirements. Your device should meet the definition in a classification regulation contained in 21 CFR 862-892. We categorize our 510(k) consulting services into three options as described below. Our client may elect to choose one or more options of our services on a needed basis. We can help you save weeks, months or years of your time to develop and bring your device products into the US market. 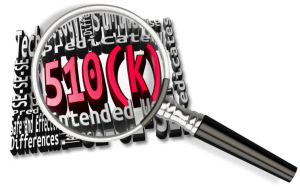 Who is required to submit a 510(k)?